Halfway There: Jesus H. Christ, Ed.D. 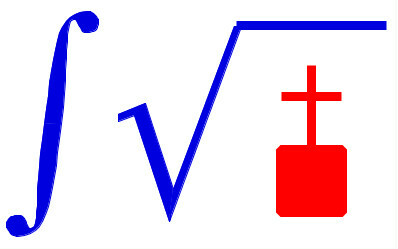 We got your Christian calculus right here! The indefatigable D. James Kennedy never ceases to provide a platform at this annual Reclaiming America for Christ conference to exponents of the Bible-blinkered worldview. On Monday, August 7, 2006, Kennedy's Truths that Transform radio program featured the first part of Dr. Paul Jehle's talk titled “Evaluating your Philosophy of Education.” Jehle is the senior pastor of a church in Plymouth, Massachusetts, as well as the principal of a Christian school and education director of the Plymouth Rock Foundation. You cannot candy-coat paganism and swallow it as godly. And because of that we need to clearly distinguish that which is Christian from that which is not Christian. If we do not, and if we fail to do that, we will often swallow something we think is Christian that will be bitter later on. That's why there is such a thing as theistic evolution, for instance. For it's the buying of a lie. It's trying to Christianize a pagan religion. In the late 1800s almost every scientist who was a Christian attempted to do that. After Darwin's book came out in 1859, everyone was trying to Christianize paganism. We have that today in almost every field. You think that's only limited to science? No way! We have christianized pagan jungle music that goes by the terminology of Christian. It's determined to be Christian because the words were Christian or the person singing it is Christian. But the issue is you cannot combine something by its nature which is pagan and built on humanistic principles and make it Christian by a magic wand. So Jehle is putting on notice all of us paganistic, humanistic, jungle-music-loving, evolutionists—even the theistic ones. I'm not strongly motivated to spring to the defense of theistic evolutionists, who tend to waste a lot of time wringing their hands over how their religious beliefs do not contradict their dedication to the scientific method. (Get over it, guys! Your religious practice and your scientific research are independent of each other. So stipulated!) To me, theistic evolutionists are not much of an issue. Jehle, however, feels obligated to beat up on them because they smear too much gray on his black-and-white world. Perhaps they even listen to jungle music, too. Shocking. You can imagine my disappointment when Jehle abandoned this topic and never returned to it. Perhaps it was my fault for not listening to the second part of his talk, but my endurance can be tested only so far. If he indeed deigned to reveal the nature of Christian calculus, I didn't get to hear about it. I would imagine that something needs to be done about the godless limit process, wherein x is routinely permitted to go to infinity without asking God's permission. Too bad that Newton and Leibniz were never referred to the Inquisition. The answer is not whether religion influences law but which religion should influence law that produces the best liberty. He's silent as it is now. It seems unfair that you ask for five examples. Would you be happy with one really good one? The United States of America was founded by men who were at pains to avoid the European example of religion-influenced government, which is why the U.S. Constitution never mentions God and cites religion only in the Bill of Rights, where it declares that the people have religious freedom. That is the reason that our country is free—because it is not officially Christian, although an aggregate of Christian sects comprise a majority of the population. While the New Age movement is full of nonsensical ideas, some of them borrowed from Eastern religions, it is foolish to identify it with Hinduism. It is even more foolish—or perhaps simply careless or ignorant—to identify Hinduism with Islam. If you bother to check, you will find many Muslims living in Europe, but precious few Islamic states. It would therefore be difficult for me to pick one. Finally, the freedom to speak comes not from Christianity, as history clearly attests through the examples of Queen Mary's England, the Inquisition's Spain, and Calvin's Geneva, but from the neutralization of religion through universal religious freedom. Be glad of that, for otherwise you would be a prime candidate to be silenced for your sedition against the liberty of the citizenry. I love the reference to "jungle music." No racists here, no, none at all! Jungle music doesn't mean what you think it means. Unless I misunderstand you. Hmmm….I do not even know what ‘jungle music’ is :-) At any rate - keep in mind that just because someone says he/she is a Christian, does not mean that he/she IS a Christian (Christ-like), and just because someone is in a position of power (such as senior pastor or principal) does not make him/her a “greater Christian” – or more knowledgeable……in fact…I suggest looking at the non-assuming individual that is content each day in living as Christ instructed (Loving God and loving his/her neighbor as him/herself)… telling about a peace that is beyond comprehension… (It’s wonderful!). I think Dr. T has a point and doubt that Jehle was referring to "jungle music" as a genre. Perhaps he can tell us the difference between what musicians call "jungle music" and its successor "dnb" (for "drums and bass"). It seems more likely, however, that he intended it as a simple pejorative. The music world uses the term without rancor to describe music with cultural roots in Africa. From the time of my childhood, however, in the era of Elvis, I heard plenty of white people denounce rock and roll as devil-inspired "jungle music" (assuming they were polite enough not to use the "n word"). I'm guessing here, but I suspect Jehle speaks as a descendant of that group rather than as a music connoisseur. Oh, my apologies, Dr. T! That's where skimming gets you, with your foot in your mouth. I missed Jehle's first reference in the quotes. And thought you were aiming your comments at the blogger. I find it weird that Jehle thinks that the science guy would "like the New Age movement", since most scientists I know have very little time for New Agey pseudoscientific stuff. When I was a grad student, my one-sentence description of my research (in theoretical solid state physics) for non-scientists was, "I simulate the properties of crystals on the computer." If the response was, "Ooooo - I *love* crystals!" then I knew that I was in for an excruciating conversation. I would have answered, "No, I'm being quiet because what you say is so stunningly stupid, I'm debating whether to let your mouth keep flapping and show you a fool, and calling the authorities because I fear you're a danger to others. "New Age stuff built on Hinduism? No, not so much as it was built on the the mellow guitar sounds of Windham Hill Records, which was the first place that the phrase "New Age" really got traction. George Winston doesn't use a Hindu piano -- and his going barefoot on stage is distinctly California, but nothing really Hindu. "Islamic nations in Europe? Are you really so stunningly handicapped in geography that you don't understand there are no Islamic nations in Europe, or are you so deluded that you think the mere presence of a few followers of Islam colors the entire culture which has a solid millennium of Christianity backing it up? "And that, by the way, is a clear answer to your desire for a 'Christian nation.' Europe has them, officially -- and either it's failed so spectacularly that Islam now rules, or it disagrees with your stomach so much you deny it -- by your analysis." It's almost amusing how often these bozos mistake stunned silence at the stupidity of what they say as their having won the argument. By such standards, the more stupid the things they say, the more arguments they win. Thanks for mentioning this post at PZ's place. I needed to see it.